CINCINNATI -- A man is dead and three people, including an 11-month-old girl, were hospitalized Tuesday morning after the man drove his car into a Winton Hills home, Cincinnati police said. The driver, 29-year-old Antoine Woods, lost control of his 2018 Toyota Corolla and hit a sign and utility pole at 2:13 a.m. before crashing into the house at 4948 Winton Ridge Lane. First responders tried to revive him, but he died at the scene. Both passengers, 23-year-old Yasmine Davis, who was sitting in the front seat, and 41-year-old Tobiase Davis sustained serious injuries and are both in serious condition at a hospital. Neither were wearing seatbelts. 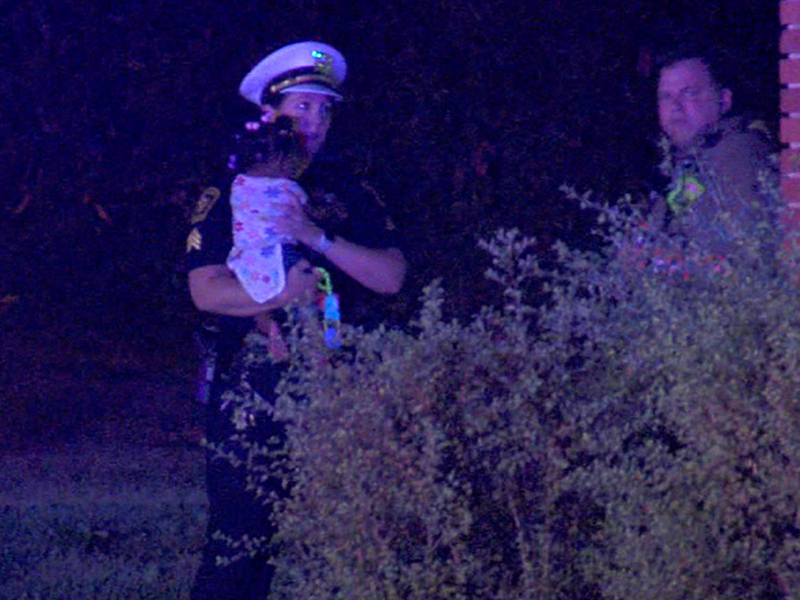 The infant was taken to Cincinnati Children’s Hospital Medical Center as a precaution and was released shortly after. The infant was in a car seat at the time of the crash; police said that saved her life. Mulitple people were inside the home at the time of the crash, but no one was hurt. Sgt. Stephanie Glueck cared for the infant immediately after the crash; she held the child in her arms before she was taken to the hospital. Cincinnati Police Department Sgt. Stephanie Glueck holds a 10-month-old girl after a Tuesday morning car crash. Glueck was promoted to sergeant in August 2017. Police said it's possible the driver failed to navigate the bend in the road, which could have caused the crash. Speed and impairment may have also been factors. The crash broke a basement window, but it didn’t cause structural damage. Cincinnati Police Department’s Traffic Unit is handling the investigation. Any witnesses should call 513-352-2514.